What is POLY-B Injection (Polymyxin B Sulphate) used for? Poly-B is an injectible solution containing the antibiotic called Polymyxin B sulfate. Polymyxin B sulfate treats a variety of infections caused by susceptible strains of Ps. aeruginosa including urinary tract infections (UTIs), meninges, bloodstream infections and eye infections. 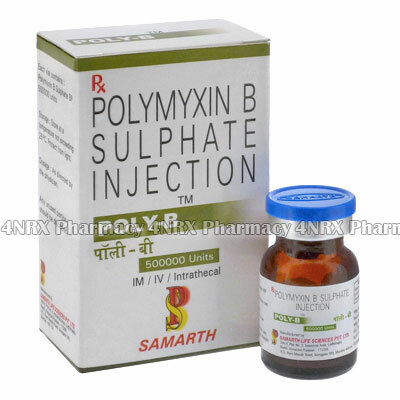 Poly-B contains a suspension of Polymyxin B Sulphate that must be diluted prior to administration thorough intravenous injection, intramuscular injection, interthecal injection or as a topical opthalmic treatment. How should I use POLY-B Injection (Polymyxin B Sulphate)? Each pack of Poly-B contains a small vial with a liquid suspecsion of Polymyxin B Sulphate. There are 500,000 units of Polymyxin B Sulphate per vial. Poly-B must be diluted in a suitable solution prior to administration. To prepare Polymyxin B Sulphate for Intravenous Injection: One vial should be dissolved in 300 to 500 mL of solution for parenteral dextrose injection 5% for continuous drip. A dosage of 15,000 to 25,000 units/kg body weight/day is usually given to adults with no kidney problems. A lower dosage should be given to adults with kidney impairment or to children or infants. To prepare Polymyxin B Sulphate for Intramuscular Injection: Dissolve one Poly-B vial in 2 mL sterile water for injection or sodium chloride injection or procaine hydrochloride injection 1%. A dosage of 25,000 to 30,000 units/kg/day should be given to healthy adults. Children and patients with renal problems require a lower dosage. To prepare Polymyxin B Sulphate for Intrathecal Injection: Dissolve one vial of Poly-B in 10 mL sodium chloride injection USP. A dosage of 50,000 units once daily is given for 3 to 4 days. This is then reduced to 50,000 units once every second day for at least 2 weeks after cultures of the cerebrospinal fluid are negative and sugar content has returned to normal. To prepare Polymyxin B Sulphate for Opthalmic Administration: Dissolve one Poly-B vial in 20 to 50 mL sterile water for injection or sodium chloride injection USP. Drops should be applied 1 to 3 times per hour. What are the side effects of POLY-B Injection (Polymyxin B Sulphate)? The most serious side effect of Polymyxin B Sulphate is a condition called Clostridium difficile associated diarrhea (CDAD) or Antibiotic-Associated Diarrhea (AAD). This can result in symptoms as minor as mild diarrhea, or in some cases can lead to fatal collitis. If you develop diarrhea while taking Polymyxin B Sulphate should be reported to your doctor immediately. Patients wwho have impaired renal function must be watched closely while taking Polymyxin B. Dosages may also have to be adjusted accordingly. If Poly-B is being given by intramuscular injection or intrathecal injection it must be done so by trained medical staff in a hospital environment. Polymyxin B Sulphate can interact unfavorably with bacitracic, neomycin, streptimycin, kanamycin, tobramycin, gentamycin, amikacin, cephaloridine, paromomycin, colistin, viomycin and any other neurotoxic or nephrotoxic drug.